Created with quality materials and exceptional attention to detail, this upholstered accent ottoman is crafted with a timeless design that aims at producing furniture with a modern trend that will keep a piece fashionable far into the future. 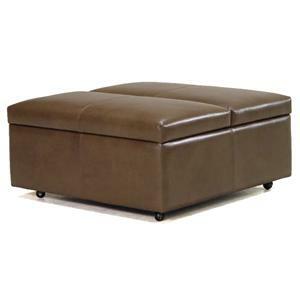 Built with a frame that uses quality materials and proven techniques, this square ottoman features a crisp lined design with a geometric structure that is contemporary yet traditional. A carefully chosen upholstery for style and durability drapes over the construction of this upholstered piece, leaving room for tailored seams and caster wheel feet. The perfect living room decor that can also act as a footrest or soft topped cocktail table, this modern ottoman is complete with an interior storage that can be revealed by opening the French door-styled cushions which lay atop this piece. The 03CK Modern Storage Cocktail Table with Small Wheel Casters by McCreary Modern is available in the area from BigFurnitureWebsite.